Yesterday I posted a Fairlady 2000 that took a RIT dye bath and came out an unintentional clone of the next Fairlady release. That was the second test in my somewhat successful dye experiment. The original test piece was a Tien-liveried Acura Integra GSR. I had done JH swaps on the other original white Tien releases, then cracked open a K-mart exclusive silver Tien S2000 to add to them…but something was obviously missing. I needed a matching dark silver Tien Integra…so I figured since my painting skills are non-existent, I’d try the dye method. This damn thing sat in the dye bath for 2 days. I tried using a microwave on the dye solution (over and over, heating up the dye and putting the casting back in the heated dye after removing the bowl from the microwave), but the process took forever. Should have used the proper stove method, but for now, I’m happy with the result. Strangely, the casting started to take on a blueish tinge towards the end, so I ended the process before it progressed further. Also towards the end, the tampos got a lot darker and lost any of the green tinge. 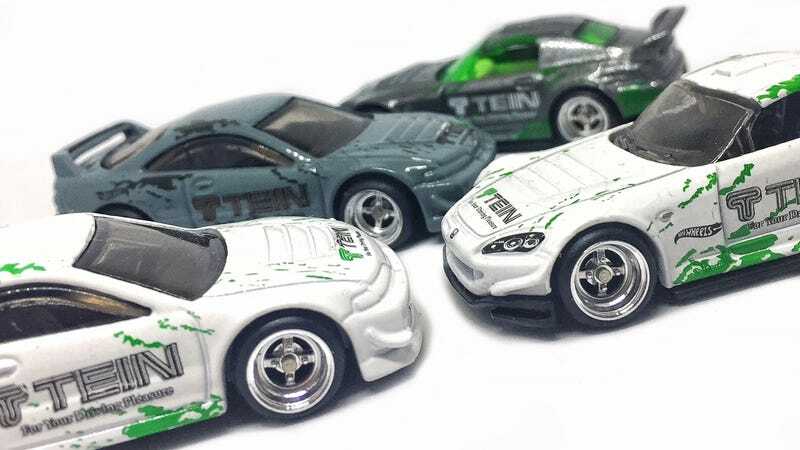 And of course, just like the Fairlady ended up resembling the pending release, I discovered there is a zamac version of the Tien Integra coming out soon….so that will get a JH RX3 wheel swap soon as I get my grubby hands on one.